New Delhi: Anil Swarup, Secretary, School Education & Literacy, Ministry of Human Resource Development urged schools to be transparent in their undertakings at a workshop conducted by the FICCI Alliance for Re-Imagining School Education – FICCI Arise. 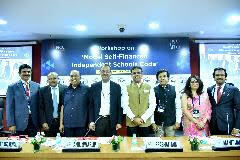 The workshop was organized to deliberate on the aspects of The Model Self-Financed Independent Schools Code and build consensus with various State Governments and Independent Schools. It impressed upon the need to have an independent code for recognition and regulation of schools established as self-financed independent institutions. The Model Code resonates with the Ministry’s vision of increasing supply and creating more competition thus bringing affordable education to the entire country. “It is important to dispel apprehensions regarding Indian school education system prevalent in the society today. The education sector in India has mafias which are important to be isolated as they bring a bad name to the school education system and the good work being done by most schools in general. I strongly believe that neither the public sector nor the private sector can take the education system forward alone. It is time that we partner and jointly work towards resolving issues. I also strongly recommend schools to be transparent in their functioning to fizzle out the negative perceptions in public.” said Mr. Swarup. The workshop which was also attended by Mr Bidol Tayeng, Secretary, Education, Govt of Arunachal Pradesh, Ms Maninder Kaur Dwivedi, Adviser, NITI Aayog, Mr Rajesh Kumar Chaturvedi, Chairman, CBSE and key officials from Governments of Assam, Kerala, Jammu and Kashmir, Gujarat, Chhattisgarh, Nagaland etc. On the sidelines of the workshop, FICCI ARISE also presented their views on Formation of National Regulator and creating Third Party Framework, Right to Education Act, proposals for jointly working with CBSE and prospects for Public Private Partnership through their initiative, project ‘Hum Saarthi’ that offers a framework for one to one adoption of government schools by well-performing independent schools to enhance the existing infrastructure and improve learning outcomes. This was followed by a break-out session that allowed exhaustive deliberations on the salient features of the code including aspects on transparency, fee regulation, penal provisions, recognition, eligible entities and limitation on providing for ‘cost of capital’. The feedback shared by the participants during the session was captured and presented to Mr. Anil Swarup.